Some wandering rays of an aimless light, Carelessly slipped into my loom the previous night… Their whimsical sparks got woven away, Within the mortal strands too busy at play… My warp was so adulterated with this vagabond burst of light That it regularly assumed a halo that blinded sight… When the trance ended I woke up to see, That the mystical dream had woven a soul for me, A soul so synonymous with the Chandheri….. The Saree has always been honored as a flattering robe that lends elegance and charm to the wearer while leisurely teasing the visual sentiments of the observers. But how often does a fabric transcend the boundaries of tactile experience to unite with that afterglow of beauty which resonates beneath the expanses of flesh? The Chanderi Sarees manage to do that every single time. These Chanderi sarees are a classic woven in the walled city of Chanderi or ‘Shishupal ki nagri’. The region is historically known for the Kati Ghati, which is a dramatic gorge that was shredded using swords in a span of 24 hours to create a victory gate in 1430 A.D by the soldiers of the Mogul ruler Jiman Khan. 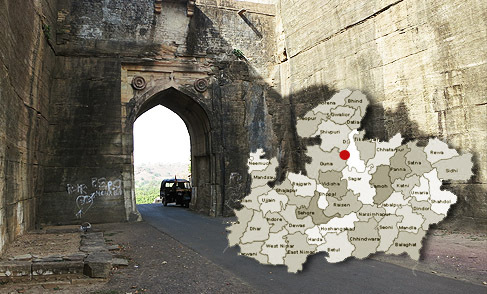 Even to this day one can clearly observe the curious cuts made by the swords that slaughtered this solid rock hill in the Chanderi’s Bundelkhand region shared with the Malwas. In Chanderi, traditional craftsmen use silk as warp and fine cotton as weft, which leads to an astounding end product, an ideal summer wear. Usually in subtle hues, these sophisticated garments are best-of-breed. 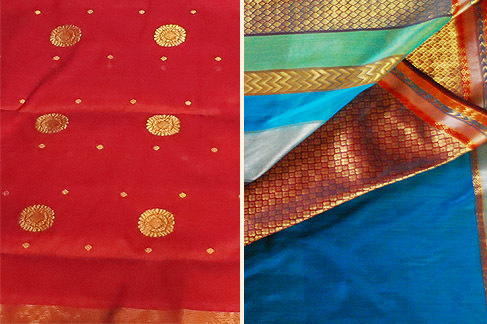 Deriving creative inspiration from the Varanasi style, the silk ‘Zari‘ sarees are most sought after. The sarees generally have a rich gold border and two gold bands on the ‘pallav’(the loose end of the saree hanging from the shoulder). 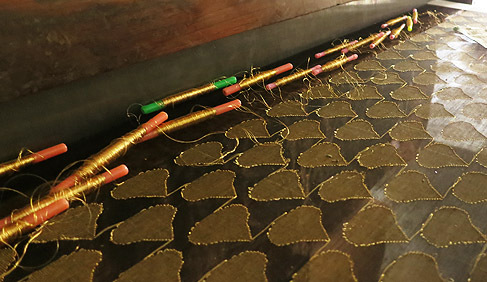 The more expensive sarees have gold checks with lotus roundels all over which are known as ‘butis’. 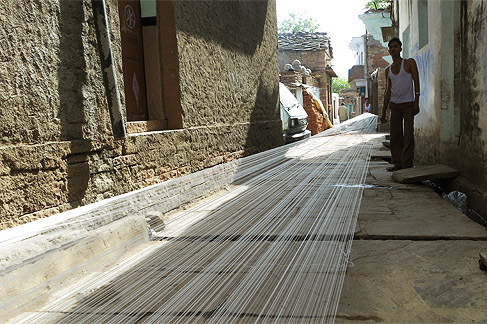 The 5000 families and their 1200 to 1500 looms in Chanderi operate from the ‘weaver’s mohalla’ which is impregnated with narrow lanes and houses built around courtyards as the homes and the workshops dwell within one common structure. 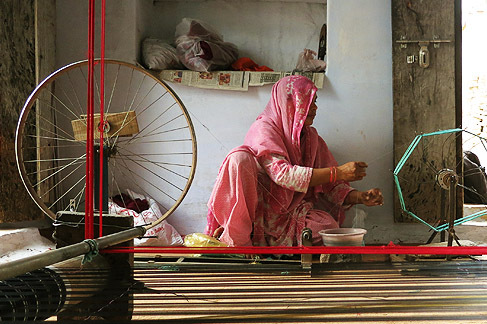 Through the coherent clacking of looms punctuated at random intervals by popular Bollywood numbers, one can see men and women working together, taming threads with their trained fingers and weaving an awe-inspiring intricacy of sorts. These laborious tasks never get outsourced, there is a definite cluster based organization of work, with different People catering to specific tasks such as makingbobins, cloring, rolling the warp threads on the wooden beam etc. while the raw material may come from far off lands for instance the zari comes from Surat, cotton from Coimbatore and the silk from Bangalore. 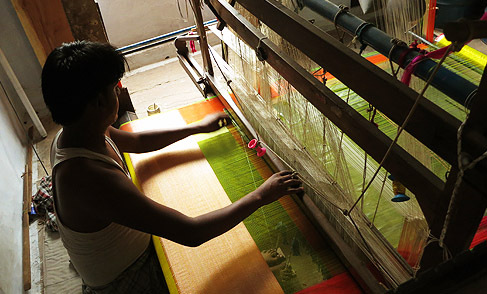 The craftsmen start by creating the design on a grid sheet where all the junctions ofintersection of the warp and weft threads are clearly set in an organized pattern. The threads are dyed to suit the same and fed into the looms. A popular local term in this context -‘Beem bandhana’ suggests the spools of thread arranged on the weft. Based on the design, threads anchored at different heights are adjusted so that some get lifted up and others settle down till common intersections are executed.The number of threads depends on the width of the woven cloth and the length on the quantity of production. 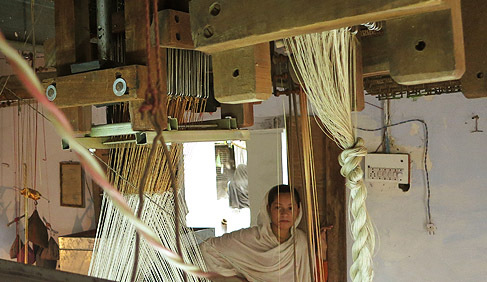 In the summers when the silk threads keep breaking off, the craftsmen use water and tighten the strands. To ensure that the threads don’t keep slipping off, the craftsmen coat their hands with soot. The entire process seeks manual labor and a good deal of strength to change the loom’s settings. 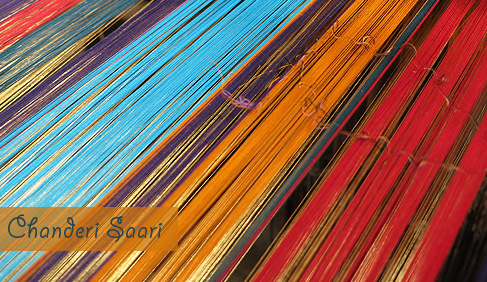 Once arranged to a particular setting with enough thread on the weft in place, the loom can deliver 6 to 8 sarees at a stretch. The women are more involved with making threads using leftovers, while the men deal with the operational mechanisms of the loom. The time required to make one saree varies from 2 to 3 days depending on the complexity of the design. 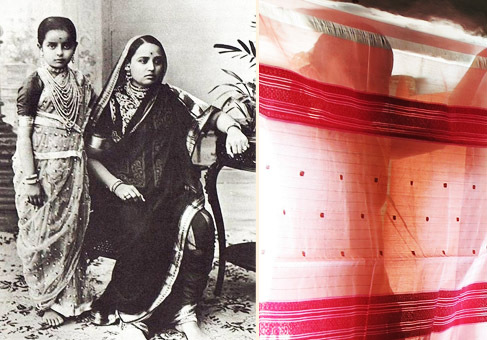 It is also intriguing to distinguish between the MP’S saree titans – the Maheshwari and the Chanderi, where the Maheshwaris’ only sport geometric patterns and are opaque, the Chanderis’ are globally famous for their floral motifs of ‘Bel-bootas’ and their translucency. In Chanderi sarees, the zari threads are not cut off from underneath the stitch and that’s how it differs from the Banarasi brocade sarees. Note The items in this category are not refundable but you may exchange this product with any other product from this category or you may get a coupon. The products in this category is handmade. These might slightly differ from as seen on digital screen. Some wandering rays of an aimless light, Carelessly slipped into my loom the previous night…..